We wanted to add a third layer of primer before laying color today. 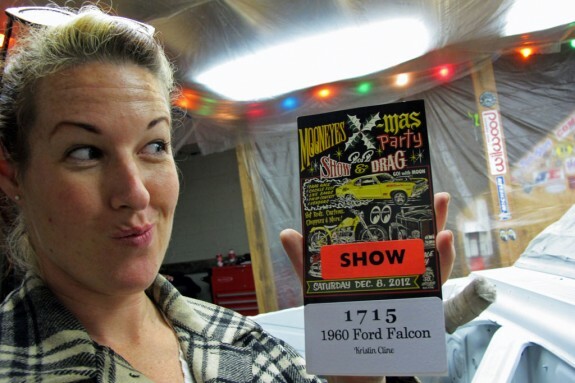 After a trip to register and insure the Falcon as well as pick up more supplies – we were back at it in the garage for a full weekend day. By the time the primer had dried and I’d painstakingly sanded the surfaces smooth (which took MUCH longer than I’d expected) it was already dark. With limited lighting in the shop, daylight seemed like a better time to spray color – so that’s first thing on the list for tomorrow. In the meantime, Ethan and I were gifted another 170 inline-six which was basically ready to go. 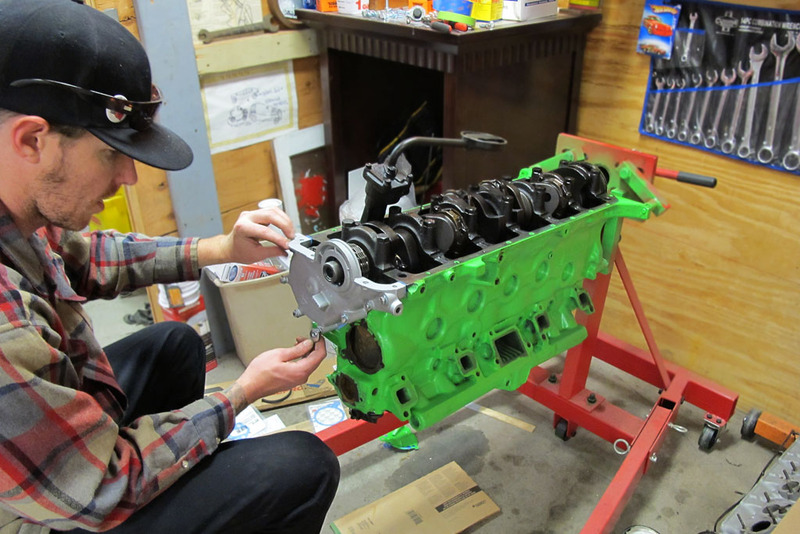 Ethan’s replaced a few parts and cleaned it up – painting it his favorite signature bright-green color (no, that’s not the color we’ll be spraying on the car). In fact I’m pretty sure this green isn’t going to look too hot next to the color we’ll be spraying – but Ethan insists it will be head-turning. Either way, it will give me extra incentive to get going on rebuilding the original. I got the Falcon emblems off the front fenders to clean up both them and the fender. Having taken a friend’s off just the other week, I didn’t expect there to be anything holding them on. Just in case, I checked – and sure enough there weren’t. 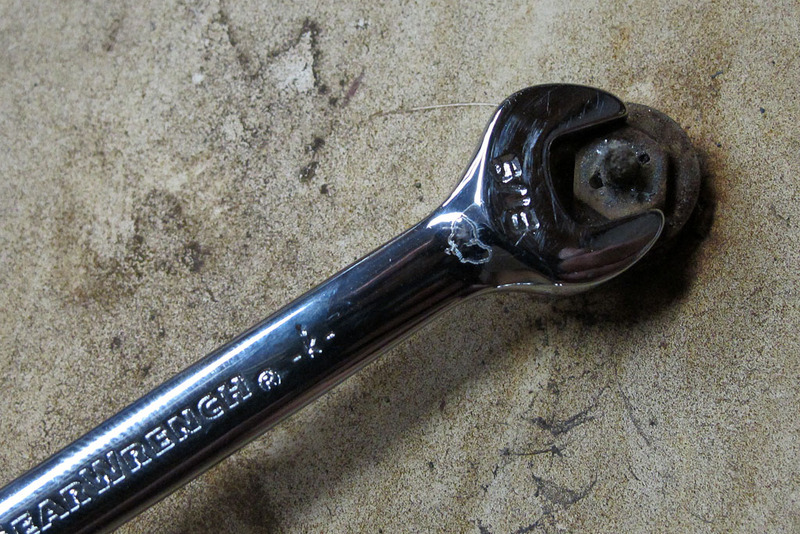 I began prying the emblem off of the opposite fender which I hadn’t checked under – and it didn’t want to budge, in fact I made a little crack in trying. Then I stopped, deciding I’d better add some Liquid Wrench to the back. I did that on the opposite one, which I’d already turned over. Then I tried prying that one, and it came right off. Turning over the fender I’d been having troubles with – that side had little bolts! After removing those, the emblem easily pulled out. In an attempt to straighten the section I’d pried a little out of whack (where the crack was made), I broke off the “n”. Lesson of the day: just because you checked one side, doesn’t mean the other side is the same! Having never done a paint job before (except metal flaking the roof of my Stude), I’m beginning to think that this engine bay job is giving me a nice break-in. 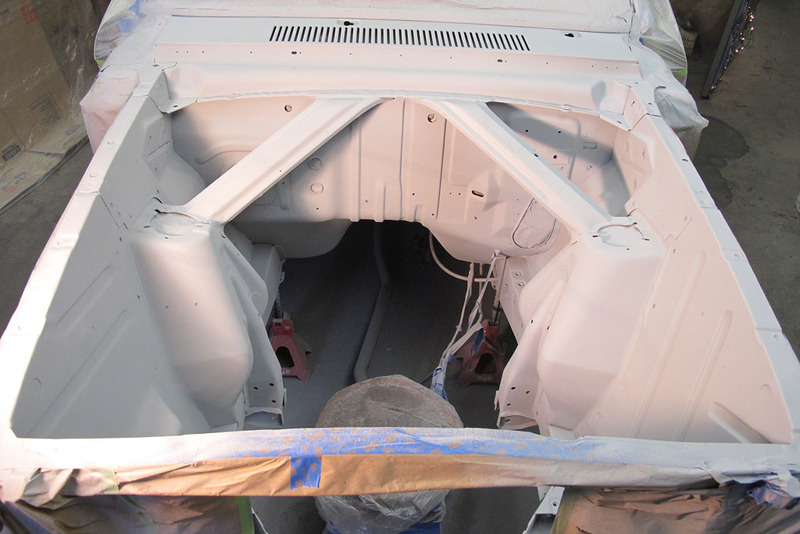 A: it’s not quite as important as the outside of the car which is in plain sight, B: with it’s many curves, nooks, and crannies it’s got to be the most difficult part to prep, sand, and spray! Walking to the mailbox at the end of the night, I discovered my Mooneyes Xmas Show registration inside. I’m excited to see what the color will look like tomorrow and even more curious how this next week will play out! The parts for the Falcon rewire should leave today. 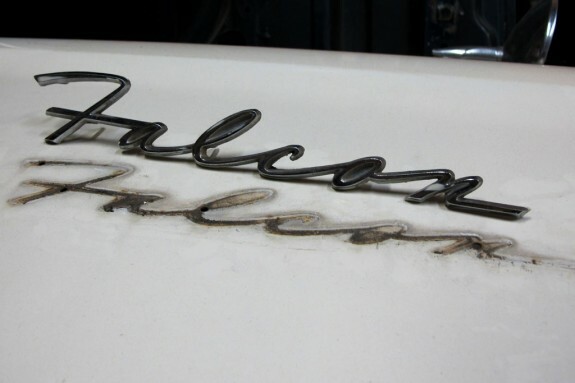 Looking forward to how ya’ll apply our Painless Performance Products wiring to your cool car. In the meantime, You and Ethan need to drive down to The Lonestar Roundup for the show on April 4th and 5th. Thanks Jeff! We can’t wait to continue taking Falcon to the next level, and new Painless wiring will sure help with that!